Home / airindia / asia / destinations / europe / india / jet airways / news / sale / tips / Dirt cheap tickets for immediate travel! Can you travel at short notice? Then some good news for you. For lots of destinations, last minute fares have dropped to very low levels, making them super attractive. The saying "Book Early to save more" is not always true. If demand is low, airlines drop prices last minute. You can now travel for much cheaper, almost rock bottom prices, with only 1 week/10 days advance booking. There's no magic formula to find the cheapest origin and destination- you need to keep trying for multiple destinations and dates till you land on jackpot. 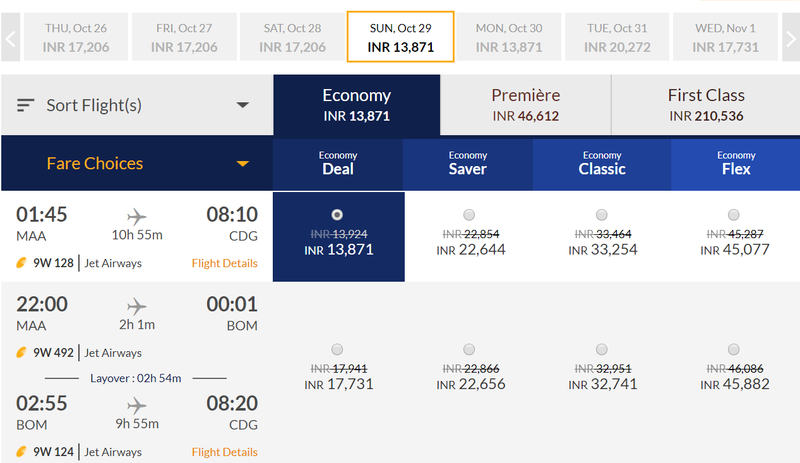 These low fares are most probably due to empty seats- not many people seem to be traveling this Deepavali season compared to last year- may be they have less disposable cash due to GST, inflation. May be people are avoiding unnecessary travel due to flood like situation in many cities. May be those settled abroad are not making a trip to home this season. Not very sure, but the result is evident. Airlines have resorted to deep discounts on select dates and destinations where the flight is almost empty. If you notice these are departures in next few weeks. If you can pack your bag and fly, this is the time. Further, if you notice, Make My Trip ad has got just a bit more informative- they are showing on which date the advertised fares are available. This is brilliant as we can instantly verify and book. Good job. May be they listened to my rant in an earlier post. 2. Return tickets: Above fares are one way. Return should be available at similar fares, but you should be flexible to try multiple dates or different airlines. 3. Convenience fee: Factor a few hundred rupees extra per person as convenience fee- may vary by website/airline. 5. Some low cost airline fares may not include check in bag, meals and such add on services. 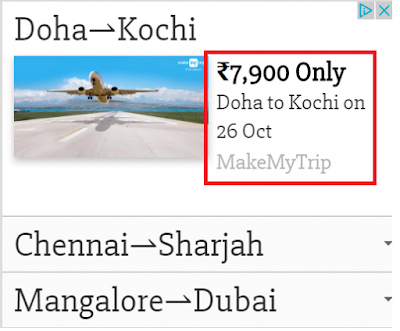 All fares as seen on airline/makemytrip website at the time of composing this post. Prices may change over time. Let me know if you booked any tickets after seeing this post. Thanks buddy indeed a detailed and useful information.